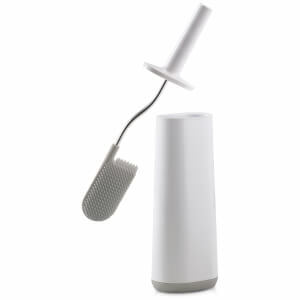 The Easystore Toilet Butler Plus from Joseph Joseph is a freestanding unit that will keep all your bathroom essentials close to hand. 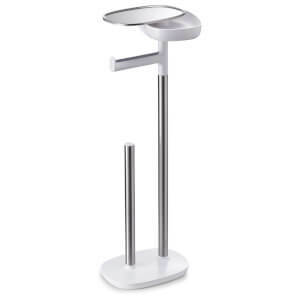 The toilet roll holder includes a Flex Steel toilet brush stored in the base and a dual-purpose shelf constructed with a stainless steel top, handy for placing a phone or book on. A concealed small drawer beneath the shelf is ideal for holding sanitary products discreetly and conveniently. The toilet roll holder features a silicone strip that offers resistance when tearing paper while the weighted base ensures stability. 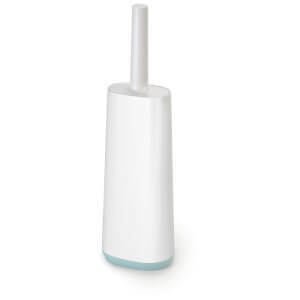 The Flex Steel toilet brush features a unique D-shaped flexible design reaches all areas, including under the rim. 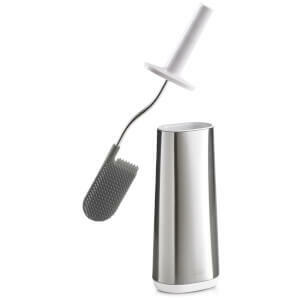 Made with durable bristles, the brush is anti-drip: it drips less between cleaning and storing and the wide anti-clog bristles allow for dirt and liquids to be rinsed off easily and comes with a slimline, fingerprint-proof stainless steel holder.